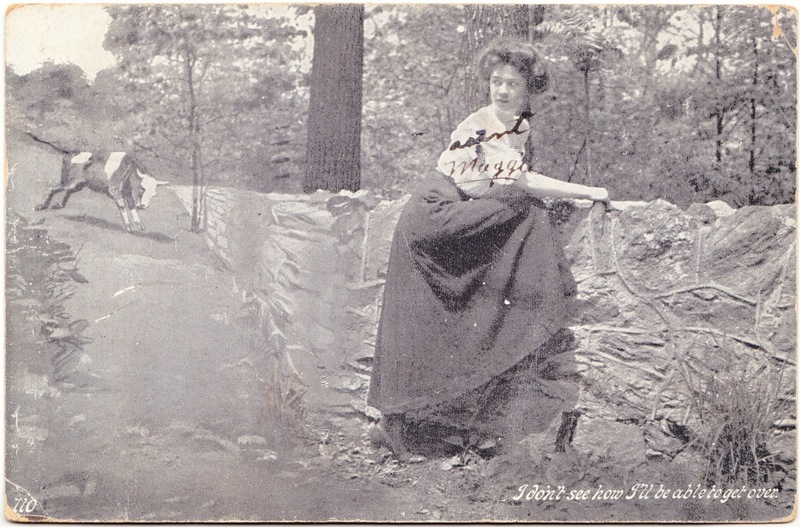 As we head toward the Blogathon finish line, this oddball postcard, mailed in 1911, features an illustration on the left and a photograph on the right, woven together to make it appear to be a seamless image of a bull charging down a path while a woman tries to escape by climbing over a stone wall. Not a bad visual effect for more than a century ago! The caption states: "I don't see how I'll be able to get over." 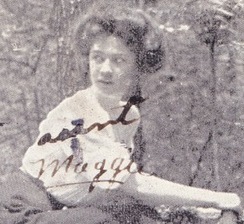 Someone has written "Aunt Maggie" on the woman, likely in an attempt to be humorous. The card was postmarked at 1 p.m. on February 25, 1911, in St. Louis, Missouri. It was mailed to the Felton family in tiny Pocasset, Oklahoma. The Grady County town only has a population of about 200 these days; I'm not sure how different things were in 1911. In addition to the town of Pocasset, the county also includes the cities of Blanchard, Chickasha, Minco and Tuttle, the towns of Alex, Amber, Ninnekah, Norge and Verden, the unincorporated community of Tabler, and the ghost towns of Acme and Bailey. No. 6Say. — How are you two old scamps. Antent [?] said Uncle Ollie was sick. — Well Aunt Maggie I know he gets the best of care. The Bull eventually gets the best of all of us. No one escapes it.